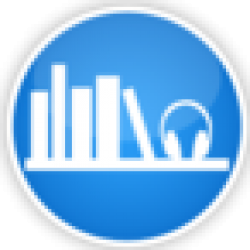 ABR's full The Synchronicity War Part 4 audiobook review and many others can be found at Audiobook Reviewer. If you haven’t listened to the reset of the The Synchronicity War series, this review may contain spoilers of those books. 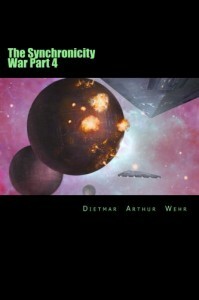 Here we are with Book 4 of The Synchronicity War the final installment. I find myself sad that this will be the last. I really hope that Dietmar Wehr writes more military space operas. If you haven’t listened to the previous three books, do your self a favor and do so. Now actual time travel is possible. We can not only send messages back in time, we can send an AI that doesn’t exist in the past back to warn ourselves of the ultimate destruction coming our way. The question is, how far back in time would you go? Would you go back just far enough to be able to build enough ships to make sure you win the unwinnable battle or would you go back far enough to stop your enemy at the source? These are the decisions that Shiloh must make. Yes, this series contains time travel. If you are like me you know that this is a tough area to write about. Paradoxes open them selves up without even realizing it. Dietmar Wehr does a great job making the time travel premise makes sense and seem plausible. I am really looking forward to more coming from Wehr. He is able to make a space opera journey have heart and soul. While keeping all the technology high tech with just enough techno-babble to keep me interested but not so much that I got board. The emphasis on the growth and development of the AI beings was one of the items that sends this series over the top for me. Along with amazingly deep and multidimensional human characters and also evolve throughout the story. Throughout this entire series Luke Daniels delivered a performance that was amazing in all aspects, and this last book is no exception. Daniels will continue to be at the top of my go-to narrator list because of performances like the one he give not once but four times in this incredible series. If you want interesting characters, amazing space battles and rival those of Jack Campbell, time travel that works, hostile and friendly aliens, convincing technology and well a whole lot of fun. This series is for you.